I set it all up and drove it today. I think it's restricted because the holes are too small and the air isn't really bypassing quickly enough. It still flutters slightly. Alright so everything is put together, including the recirc valve, but it still dies on let-off. I've got IAC connected which makes a good effort to try to save it, but usually fails as it isn't quick enough. I don't understand why it still dies even after I have the valve set up. I included a picture of my setup, trash talk my garden hose all you want but at 2$ a foot, I can't complain. My recirculated air comes in 3 inches from the maf with no issues. I had the same-ish issue when I +t my car, it turns out the way i routed the pcv system, it was creating a slight vacuum leak making my car die on let off. How is yours set up? My pcv is a separate system and doesn't use vacuum currently (been switching between using vacuum and not to see effects). Maybe tomorrow morning I'll boost leak test it and see if there's any leaks. I have evo, silvia, subaru, skyline, and GTR BPVs on the shelf here, and have run the GTR up to 18psi (Holset) with zero issues, and without modifying it in the first place. The collection has slowly formed over time so I can put a "leaks at" number on each one with the help of my compressor and some time in the shed. GTR ones have 38mm outlets! More than ample for my Holset HE351CW, or pretty much any turbo, actually. How much (psi) are you going to thrash the Holset/rods/pistons? Or are you worried about outright flow? If the latter, think of it as a serious leak to ensure no serious pressure spike can occur. Does the car idle normally? To establish a baseline, I'd disconnect the wastegate actuator and wire the wastegate OPEN (no boost) and see if the engine operates normally on/off throttle. I suspect that there is a vacuum leak somewhere that shows up under high vacuum conditions (off throttle decel). Also, your recirc valve plumbing has a lot more hose than is really needed. 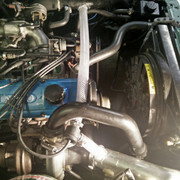 Typically they only connect between the turbo inlet and turbo outlet vs coldside piping. I'm trying to get a bov so I don't have to fuss with this diverter valve any more. Ive been reading up and been finding some wishy washy information on this so humor me. I don't care for the choo choo sound and don't want to mess around with stalling. Have you tried a method of taking the turbo boost out of the equation and verifying that your car doesn't have the stalling issue regardless of what kind of bov/recirc valve you use? Is your engine stock otherwise (injectors/chip/cam timing, etc)? Since I've moved the maf, I've done away with the recirc for now. It'll just be a bandaid until I can get a bov so I don't feel like putting it back in.